Why Was Petraeus Fact-Finding While CIA Was Spinning “Facts”? The WSJ has a story that captures a lot of what I’ve been pointing to in Petraeus Surge-Out. It explains how the investigation played out even as career CIA people objecting to Petraeus’ regimented management style. It describes Petraeus’ intent to stay on nevertheless. And it shows–as I have–how Petraeus was dealing with the investigation even as CIA was attempting to push back on claims it had botched the Benghazi response. At CIA headquarters in Langley, Va., officials began debating whether the CIA should be more active in countering the criticism. 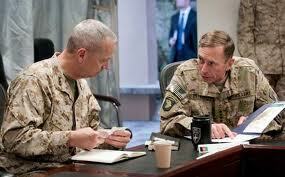 Mr. Petraeus, in particular, advocated a more aggressive defense. As questions mounted, a Fox News report Oct. 26 alleged that the CIA delayed sending a security force to protect U.S. Ambassador Christopher Stevens and others who were under attack. Mr. Stevens and three other Americans died. The CIA denied the report, then began pulling together its own timeline of events. The Pentagon, the State Department and other agencies objected to Mr. Petraeus’s decision to mount a solo defense. “We conveyed our objections. Multiple agencies did,” a senior military official said. Mr. Petraeus’s decision to release the CIA’s timeline to the press didn’t sit well with Mr. Clapper, who was unaware it would be made public, officials said. Other agencies saw Mr. Petraeus’s decision as a step aimed at presenting the CIA and Mr. Petraeus in the best light and forcing them to accept the brunt of the criticism. But this account misses some crucial details of the timeline, which are all important as the Benghazi hearings play out this week. First, remember that Paula Broadwell made one of the first responses to the Fox story, though she seemingly confirmed their report that (among other things) the CIA delayed its response because it had prisoners. Consider Petraeus’ actions two weeks ago. The FBI interviewed him in a scandal he believed he could survive. And then–seemingly almost immediately–he hopped on a plane for a “fact-finding” trip in anticipation of this week’s testimony. That conveniently put him out of the country as CIA conducted the spin campaign that–as WSJ reports–top officials and DOD, DNI, and State objected to. But here’s the most important bit: The CIA put out information at a time and in a manner the rest of the national security establishment objected to. It claimed–and WSJ’s sources still claim–that “the record was corrected,” implying that the CIA offered the truth in its spin on November 1. If so, then why was Petraeus on a fact-finding trip at all? If they knew enough to know what the record showed, then why did Petraeus have to fly to Libya to find out what the record showed? The answer may be as simple as Petraeus was just getting out of town to avoid any responsibility for a spin campaign that other NatSec officials objected to. It may be he went on a junket (ha!) to reflect on whether his diddling might sully his pristine image. But I doubt that. Given the importance the Intelligence Committees have placed on the report from Petraeus’ trip, and the reluctance CIA has shown in turning over that report, and Petraeus’ initial reluctance to testify to Congress about what he learned on his fact-finding trip, it seems highly likely that “the record” as reflected in that trip report does not match “the record” the CIA is so satisfied that it fed to reporters (to the WSJ team’s credit, they were by far the least credulous about the CIA’s so-called record). One of two possibilities must be correct: The CIA deliberately put out a timeline it knew to be incomplete–if not deceptive–at a time and in a way that the rest of the NatSec establishment objected to (which might explain why it is so reluctant to give the now-revised timeline to Congress, because it will be caught in deception). Or, Petraeus’ trip to Libya and other countries had nothing to do with what he claimed it did, fact-finding on Benghazi in anticipation of this week’s hearings. The reporters who attended the November 1 briefing appear to have been suckered into reporting on CIA’s claimed timeline even while Petraeus was actively trying to learn what that timeline really was. They really ought to ask CIA why that timeline was presented as settled fact, then. https://www.emptywheel.net/wp-content/uploads/2016/07/Logo-Web.png 0 0 emptywheel https://www.emptywheel.net/wp-content/uploads/2016/07/Logo-Web.png emptywheel2012-11-15 07:53:352012-11-15 07:53:35Why Was Petraeus Fact-Finding While CIA Was Spinning "Facts"? Last night, WaPo reported that the FBI is still trying to figure out how Paula Broadwell got classified information they found on her computer and–it looks like–in her home. As the WaPo correctly points out, this new investigative push is surprising, because the FBI has already been blabbing for several days that no charges would be filed. While it’s not the central thrust of Miller’s piece (whether or not Congress should have been informed is), it’s too soon to know whether DOJ is playing favorites or not. But up until this latest report from WaPo, it appeared they were playing favorites. After all, DOJ charged people–like Thomas Drake–for retaining unclassified information, information he had been directed by the Inspector General to retain. DOD charged Bradley Manning with retaining classified information. Retaining classified information improperly is a crime, even if you have clearance to view the information. Sure, it’s usually used as a proxy for other crimes for which no evidence exists. Or, in the case of Drake, in an effort to get him to plead guilty to other crimes. But if DOJ is going to use it as a tool to persecute leakers, there is no reason it should exempt General Petraeus’ one-time mistress. I’m not saying I want Broadwell to be charged, nor am I saying I think DOJ’s use of such charges in the past is proper. But that’s the problem with witch hunts, isn’t it? They either stick out as arbitrary political prosecutions, or they set a standard that few in the national security establishment could meet. Update: Ut oh. Broadwell might get herself in trouble after all. A computer used by Paula Broadwell, the woman whose affair with CIA director General David Petraeus led to his resignation, contained substantial classified information that should have been stored under more secure conditions, law enforcement and national security officials said on Wednesday. The contents of the classified material and how Broadwell acquired it remain under investigation, said the officials. They spoke on condition of anonymity because they are not authorized to comment publicly. But the quantity of classified material found on the computer was significant enough to warrant a continuing investigation, the officials told Reuters. Though it sounds like they’re only contemplating stripping her security clearance. Which would mean they’re striking a middle ground between treating her as they’ve treated others and retaliating against her for getting the sainted Petraeus in trouble (because of course grown men never get themselves in trouble). Update: CNN now reporting that Broadwell has had her security clearance revoked. DO YOU KNOW THE WAY TO TAMPA BAY?? Gen. John Allen, the top American and NATO commander in Afghanistan, is under investigation for what a senior defense official said early Tuesday was “inappropriate communication’’ with Jill Kelley, the woman in Tampa who was seen as a rival for David H. Petraeus’s attentions by Paula Broadwell, the woman who had an extramarital affair with Mr. Petraeus. In a statement released to reporters on his plane en route to Australia early Tuesday, Defense Secretary Leon E. Panetta said that the F.B.I. had informed him on Sunday of its investigation of General Allen. Mr. Panetta turned the matter over to the Pentagon’s inspector general to conduct its own investigation into what the defense official said were 20,000 to 30,000 pages of documents, many of them e-mails between General Allen and Ms. Kelley, who is married with children. Really, at this point, what can you even say about the secret storm soap opera that roils within the rarified brass air of the US Military? This was just the last hit for a night that saw the emergence of the Shirtless FBI Guy (now under investigation himself by the Office of Professional Responsibility at DOJ) to a nightime search of Paula Broadwell’s home by the FBI.